Description: The year is 1782 and the British citizens of Gibraltar are suffering, badly! Since 1779 their town lay under siege by a combined army form France and Spain, trying to kick the Brits out. 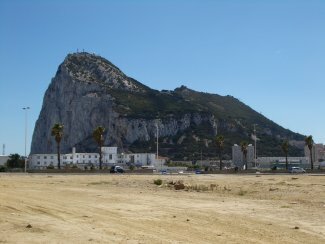 Food shortages, dreadful diseases and incoming cannon balls constantly plague the citizens and soldiers of Gibraltar. The besieging armies on the other end however had happily dug in, in such a way that they were out of reach for the British guns. To smite their foes and break the siege, the British had to find a way to place their cannons in such a position that they could strike terror into the French and Spanish ranks. 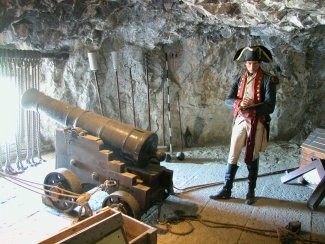 Sergeant-Mayor Ince, being the clever chap that he was, put forward the idea to excavate galleries in the large rock which comprises most of Gibraltar, so that guns could be placed on positions high in the rock overlooking the enemy. This provided a perfect striking position, which was at the same time totally protected against incoming enemy fire. This innovative idea helped to end the Siege in 1783, with Gibraltar still firmly in British hands. 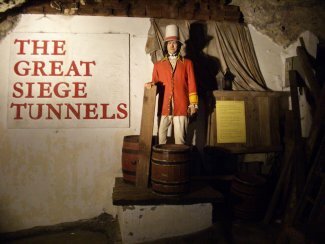 The Great Siege Tunnels museum is composed of all the galleries and tunnels which were dug out during the Great Siege. 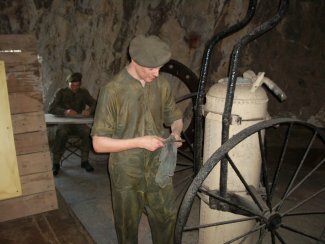 Not only can you walk through the original tunnels and enjoy the splendid views provided by the gun positions, you'll also come across a lot of life-like dioramas. 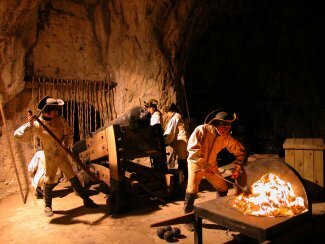 They depict scenes of the digging-process involved in creating the tunnels, the calibration of the gun positions and the firing of the guns amidst the fog of war! You really get a sense of what it must have been to live and work there during the siege. A compliment has to be made for the Spanish translations which accompany the various displays, you won't see it the other way round at the opposite part of the border! 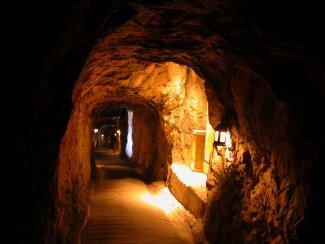 If you're in Gibraltar, make sure to visit the Great Siege Tunnels. If you've got some time left, also visit the three museums a bit further down Willis's Road: Moorish Castle / A City Under Siege Exhibition / Military Heritage Centre. The characteristic entrance to the tunnels which will lead you further into The Rock. As it was 'the good old days', real tunnelling equipment wasn't available and the engineers dug the tunnels using dynamite and lots and lots of blood, sweat and hand labour. 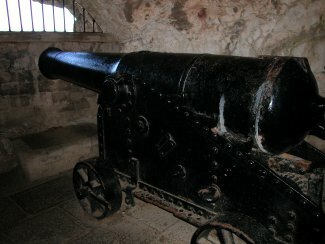 One of the gun positions facing Spain. 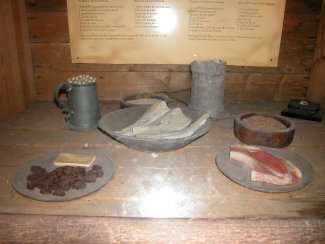 Food rations had to be strict during the siege. At this picture you see all the food a man had to live on during an entire week of hard labour! A small section of the tunnels. Calibrating the exact gun position was a difficult job. Eighteenth century soldiers giving their best to fire shot upon shot into the ranks of the enemy. With all the smoke and the ill ventilation it was hard work. 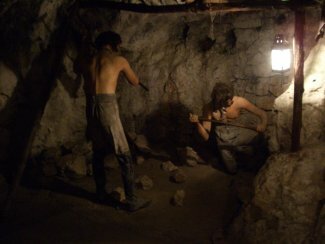 Modern soldiers at work in the tunnels. View from the entrance of the Siege Tunnels towards Spain. At the front is the airstrip of Gibraltar enclosed by sea at both sides (must be one of the hardest runways to handle! 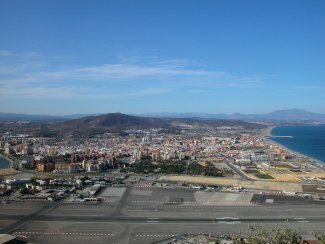 ), at the back you see the Spanish border town La Linea.